This dish can be prepared well ahead of serving time. 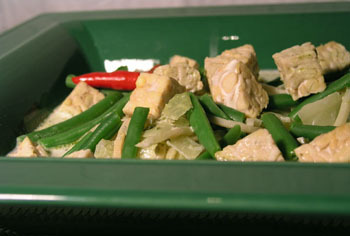 In fact, the flavor is enhanced when the tempeh is allowed to absorb the curry flavour for a while. Fry the onion and garlic for 2 minutes and add water, galangal and bay leaf. Bring to boil for about 5 minutes. Add tempeh, beans and coconut milk. Season with salt and sugar and boil for another 15 minutes.